Planning a party can be stressful on both the mind and the wallet. Many of the services that provide party rentals on KidsParties.Party offer affordable prices and competitive rates, while still delivering quality products. Best of all, they will alleviate some of the stress by taking care of set-up and clean-up for you. Scroll down to see a list of items available for rent in Connecticut. What Will You Rent for Your Next Event? It can be overwhelming choosing the perfect rental for your party. We've detailed the many types of party rentals available, as well as what type of event they are the perfect fit for. 1. Inflatables: Renting an inflatable for the afternoon is a guaranteed way to make sure all kids are occupied and having fun at your party. Inflatable companies are licensed, insured and will usually take care of setting up and dismantling the inflatable. 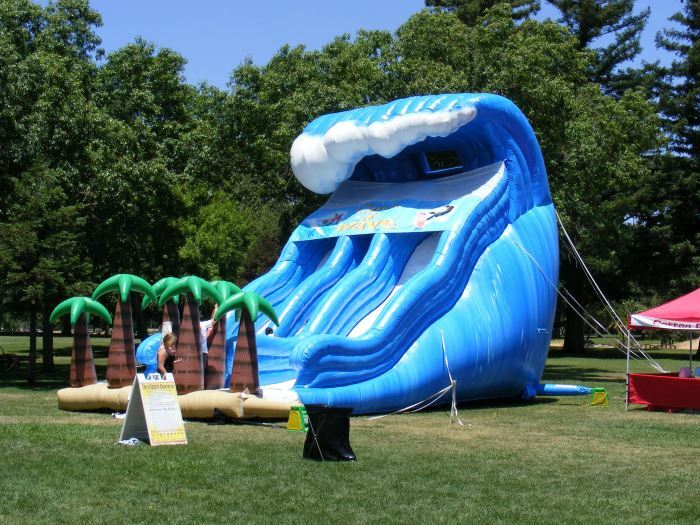 Inflatables are perfect for backyard parties, block parties and festivals. 2. Tents: Mother Nature is an unpredictable force that we cannot compete with, but by renting a tent for your party you are protected from any potential inclement weather. Party tents provide shade from the sun and keep your guests dry in the event of light rain. Consider renting a tent for any outdoor party or event, no matter what the weatherperson predicted. 3. Event Furniture: If you do not have enough tables or seating to accommodate your guests, consider renting them from a service. Coupled with your tent rental, the family backyard will practically be converted into an actual party venue. For indoor parties at banquet halls or event spaces, lounge furniture can give your mitzvah or sweet 16 an upscale nightclub feel. 4. Catering: Cooking endless trays of food and asking people to bring appetizers and desserts to your party gets tiring. Having a catering service prepare, set up and clean up everything saves you time, money and effort. Choose the menu that sutis the mood of your party, whether it's for your baby's first birthday or their graduation party. 5. Extras: Now that you've got the basics covered, why not add some exciting, innovative pieces to your event? Interactive games, photo booths and special effects lighting are just a few of the many rentals that will take your party to the next level. KidsParties.Parties wants to help make your party perfect. We are proud to feature rental services that are trusted, reliable and serve your area of Connecticut. Do You Have A Rental To List? Fill out this form to get listed today. It will only take two minutes! If you are a parent, check out our birthday advice. We have written a lot about different things you can for your child's birthday party. We want them to have the best birthday yet, so we put together a list of over one hundred things you can do for that. We also have hundreds of birthday wishes handwritten and 100% unique for your cards. Try our invitation maker to make the next event even better! You can choose from a large variety of custom templates, or create your own using your child's photo.